Adas Erbinnen 2016 - #WomenInTech-Interviews - jetzt downloaden! Home » News » Ada’s Heiresses 2016 – download it for free now! Ada’s Heiresses 2016 – download it for free now! 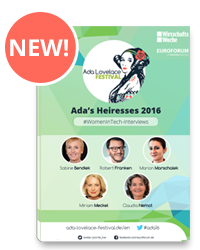 For our collection of interviews called Ada’s Heiresses 2016 we talked to Sabine Bendiek (Microsoft), Robert Franken (Male Feminists Europe), Marion Marschalek (GData), Miriam Meckel (WirtschaftsWoche) and Claudia Nemat (Deutsche Telekom). #ada16 dove into an interview marathon recently. The outcome is Ada’s Heiresses 2016. For our second edition of our #womenintech intervie collection we talke to two chairwomen of DAX board companies, the editor of Germany’s leading business magazine, the hacker who dicovered the French governement’s Trojan horse software and the founder of the platform Male Feminists Europe. What we’re especially proud of: All interviewees will take the stage at Ada Lovelace Festival in Oktober in Berlin. And now have fun reading!